It was in Peru where I enjoyed a Pastel de Papa that was earthy, flavorful, no pretensions. A potato (papa) and meat dish that you want to eat all day long ! La papa (not the Catholic pope) was first cultivated up in the Andes about 6,000 to 10,000 years ago, in the region of Lake Titicaca. So Peru is the country that can lay claim to the potato (Rodriguez, 2010). However, some Chileans lay claim to the potato’s origins as do some Bolivians. Well my personal conviction is that I’ll say whatever I need to in order to get served this delicious pie. Pastel de Papa is a blending of European, Asian and Native American ingredients. 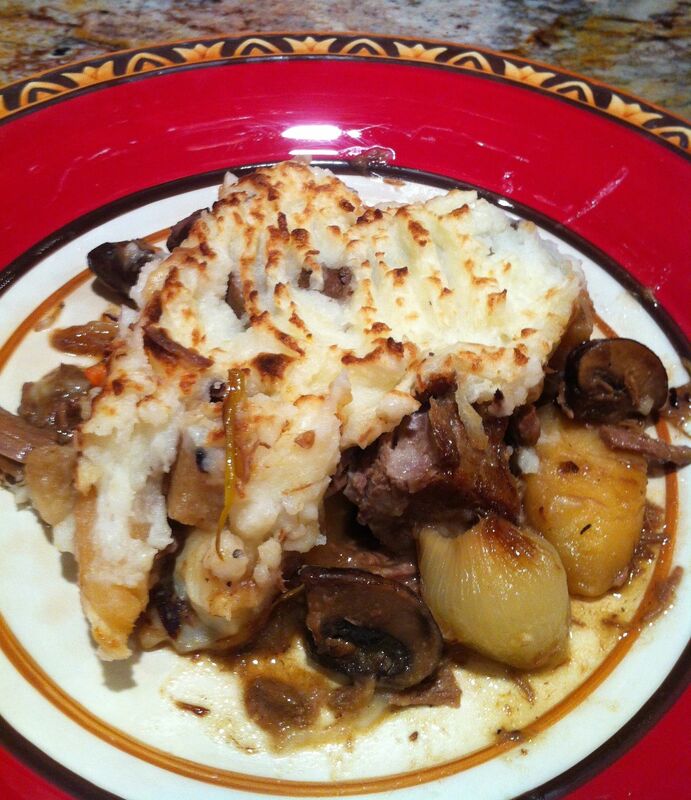 In Europe the dish is known as Cotttage Pie when it includes beef and Shepherd’s Pie when it includes lamb. But they all share the potato as the topping and sometimes also as the crust. I know it’s summer but since I had to do something with leftover roast and since I’m craving potatoes, Cottage Pie, Pastel de Papa, had my name on it. In this recipe I use a crockpot to minimize heat inside the house and I disregard baking. Improvise! You can put the meat in the crockpot when you leave for work and it’ll be cooked when you get home after work. I plug it outside on the porch. Cooking the vegetables separately on the stove top keeps their individual flavors sharp and distinct. Vegetables: You can see from this list how easy it’d be to leave out the beef and have a vegetarian feast. -2 lb russet potatoes, peeled, cut into fourths. These are the large baking potatoes that are fluffy, not waxy. 1. Place all the meat ingredients in a crock pot, medium setting, and go to work or do something while it cooks for about 8 hours or a bit longer. 2. Remove the meat from the crockpot, cut into 1″cubes and set aside. 1. In a small bowl combine the flour and butter to make a paste. 2. Heat the beef broth and water in a saucepan and then add the paste, whisking continuously to avoid lumps. 3. Bring to a simmer and stir for about 3-5 minutes until the flour cooks completely and the sauce thickens. Set aside. 1. Place the potatoes in a large saucepan or pot and cover with the water and salt. Bring to a simmer and cook until soft, about 20 minutes. 2. Drain and then pass them through a ricer. 3. In a saucepan heat the milk, butter, salt, and pepper. 4. When heated through, add the milk mixture to the potatoes and fold gently to combine. Set aside. 1. Spoon the meat and the vegetables onto a large glass casserole. 2. Then pour the sauce into the casserole and gently combine. 3. Spread or pipe the potatoes evenly on top. Make little decorative incisions with a fork as you like. 4. Microwave for 3-5 minutes until bubbly. 5. Optional: brown the casserole in the broiler for 3-5 minutes. Serve and enjoy as though you were in Chile, or Peru or Ireland!